Star performers can be differentiated from average ones by emotional intelligence. For jobs of all kinds, emotional intelligence is twice as important as a person’s intelligence quotient and technical skills combined. Excellent performance by top-level managers adds directly to a company’s “hard” results, such as increased profitability, lower costs, and improved customer retention. Those with high emotional intelligence enhance “softer” results by contributing to increased morale and motivation, greater cooperation, and lower turnover. The author discusses the five components of emotional intelligence, its role in facilitating organizational change, and ways to increase an organization’s emotional intelligence. Although rapid-fire change in health care continues to wreak havoc in organizations, it is now considered ordinary. In fact, the chaotic milieu in which health care organizations find themselves is no longer considered noteworthy. Posted by Donna Strickland in Articles, Emotional Intellligence, Free Resources. In order to shift your energy from activities that drain you, to self-nurturing activities that energize you and reflect your priorities as a leader…you first need to understand where your time goes. Every action you take uses energy, and every action you don’t take use energy. Identifying energy drains means seeing both where you do things that do not serve you and where you do not do the things that you most need to do. Which of these are you “caught” in? 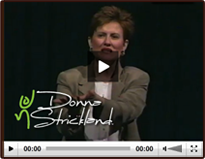 Posted by Donna Strickland in Dynamic Keynotes, Free Resources. What are your strategies for living well? Know your Adversity Quotient: Are you a Quitter? Camper? Climber? Beef up your Resilience. Give Extreme Self-Care the highest priority. Be purposeful in Conversations: Choose the message you want to convey. Create opportunities for people to identify what they care most about in the situation at hand, to take some time to name what the most important issue or principle is at stake, and finally to identify what their complaint shows them that they are most committed to.